John Hulkoff is a satisfied man. A two-year interior and exterior refurbishing project to spruce up his 30-foot Willard Vega Shining Path is finished. 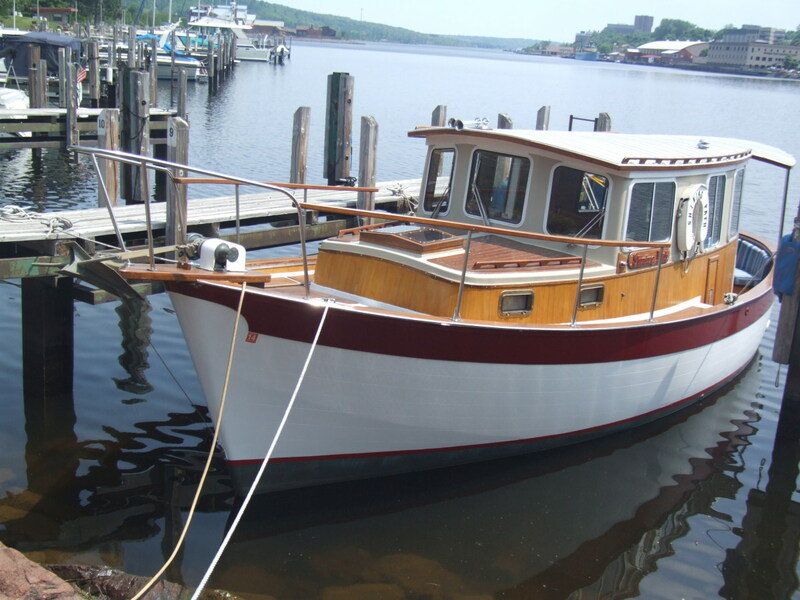 The “after” is all he dreamed of, and more, thanks to custom work by Russ Lepisto, a local carpentry wizard with a love for all things boating. He found Shining Path in Sister Bay, in Wisconsin’s Door County on Lake Michigan. 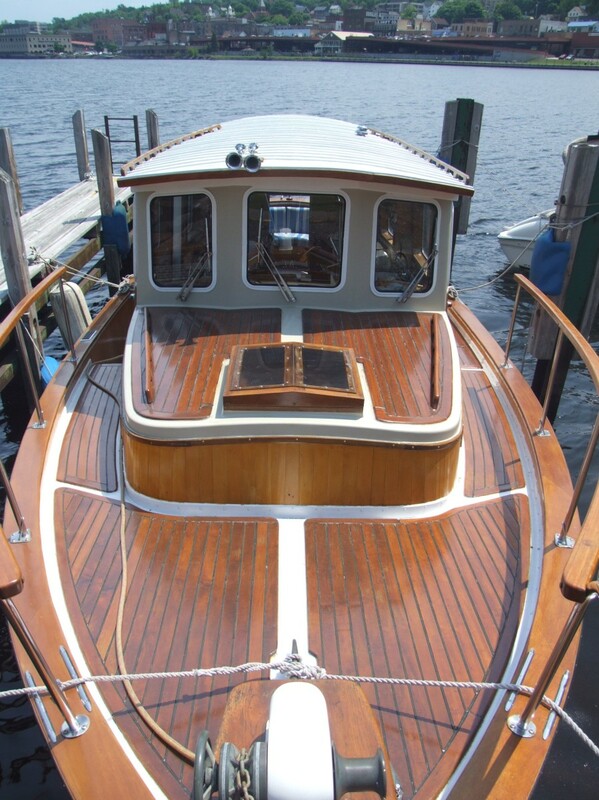 The 1976 model listed for $49,000 was one of approximately 15 fishboat versions built by the Willard Company. Most were stationed on the U.S. West Coast or employed in the Alaskan fishing industry. 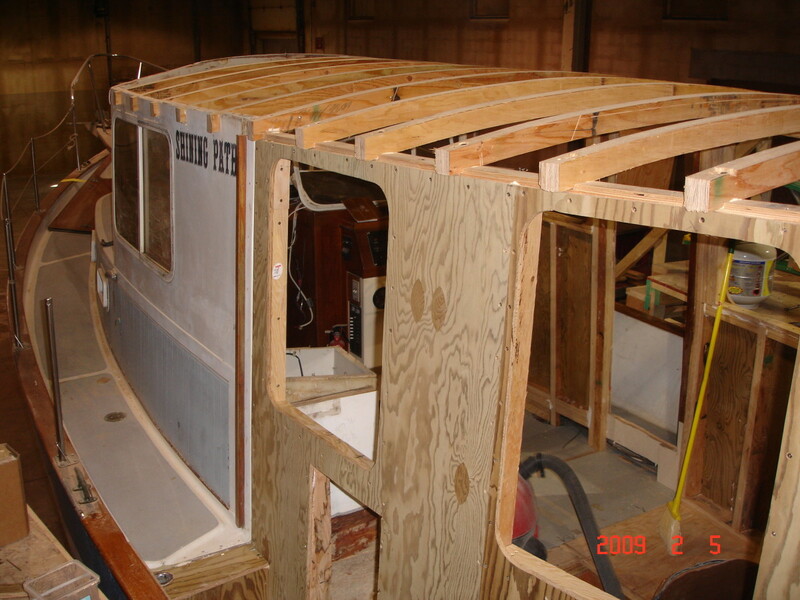 The craft’s full-cement keel was a definite selling point when the Laurium-born Michigan Technological University grad retired from his work as a forester for the downstate city of Detroit, moving back to his hometown on the Keweenaw Peninsula in Michigan’s Upper Peninsula with wife Nancy. Nancy has been planning “surprise trips” for John for years. She advises him on what to pack, but the destination is kept secret as long as possible. When they landed in Door County, “he was in heaven, looking at all the marinas,” she says. Inside a storage building up on stands stood Shining Path. The couple has since heard all the jokes related to the South American guerrilla organization that goes by the same name. Suffice to say terrorist warfare has nothing to do with their placid home on the water. “The dinette was dinky,” says Russ Lepisto. Originally welcomed aboard to fix the caprail, he’s the mastermind behind the all-out renovation. “Russ did that job for us and said ‘I want to work on this boat.’ He only does projects that he really wants to do. And we had some rotting problems with the old interior that we had to address,” notes John. 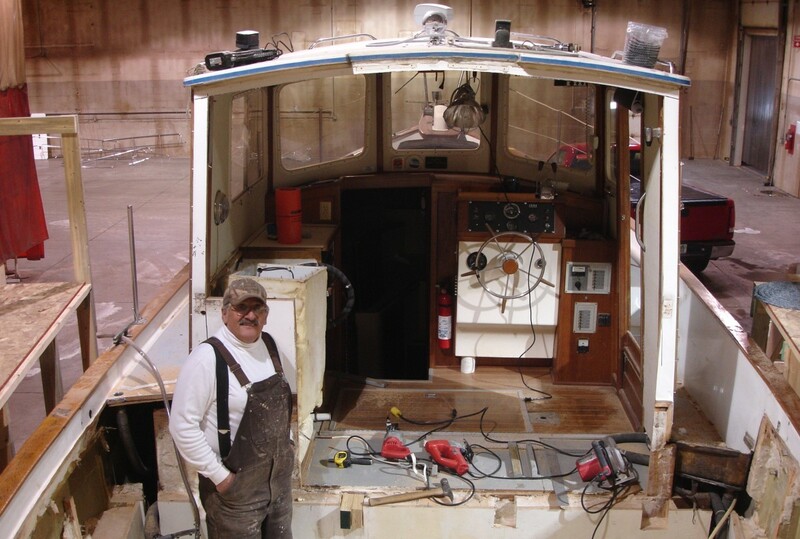 A smiling Russ Lepisto—master woodworker and life-long boater—surveys the project in progress. The wood was ordered from local Copper Country lumberyards, including Horner Flooring of Dollar Bay, famous for its NBA and collegiate basketball courts. Horner was the cherry-wood source; other wood used on the interior remodel is local white cedar. But before any “messing about” could begin, John had to bring Shining Path north. He remembers the boatyard crew shaking their heads when he assumed it could be towed with a conventional vehicle. “I ended up buying a dump truck for $8,000,” he recalls with a rueful smile. “And that was after buying a four-axle trailer. I towed it up here with my little grand-daughter from Novi (downstate Michigan). Nancy spotted the dump truck along the shore of Keweenaw Bay on her daily drive to work. John bought it in 2009 for a home-improvement project: putting in a full basement. The excavated sand helped form the basis for the next development on the Hulkoff horizon. “I’m to build Nancy’s cabin in the woods,” he says. Initially in 2001 the boat was hauled to Van Straten’s boatyard at the windswept and picturesque old Henry Ford factory site in Pequaming, on Lake Superior’s Keweenaw Bay. Things got off to a heart-wrenching start when scion Pete Van Straten splashed the boat without putting in the plug. Luckily the gaffe was quickly remedied. In subsequent years the boat was lifted out across the bay on the Portage Waterway at Julio Construction’s working-man’s boatyard near Hancock. Shining Path ultimately moved twice more on dry land, first in January 2009 to her winter storage at the former Blizzard Corp. manufacturing warehouse at Houghton County Airport’s industrial park, where Russ set up a sturdy scaffolding system to begin the project. “The first thing I did was make a walkway with handrails going all the way around,” he explains. A symbiotic happenstance: the warehouse previously served as a boatworks for the Niemela Brothers, notes Russ, adding that “winter in a warm place” was just what the carpenter ordered. Shining Path was out of the water for all of 2009, summering and wintering over at Russ and wife Duffy Lepisto’s home until she was launched in late August 2010. During the project Russ had some help from grandson Zack Kujula. “He stayed with us for 3-1/2 years when he went to MTU, working with Russ when time allowed (summers mostly),” says Duffy. “He’s now a civil engineer grad and working in Ohio!! !” notes the proud grandma. Duffy can take credit for getting the ball rolling on Shining Path’s transformation. Active in the community, she introduced John to Russ at a local civic organization meeting. The project has firmly cemented a new friendship. The exterior remodel was a radical do-over aimed at creating more interior space. “The cabin was so short,” says Nancy. “The cabin was extended approximately eight feet … the original Willard didn’t have a design like that. My main concern was that the hull had a lot of sprung sheer and the cabin had to incorporate some of that sheer line to look authentic,” explains Russ. “I wanted to stay true to the design.” He incorporated a slight rounding to the raised and extended back cabin and door in order to maintain the Willard’s original lines. The vessel had sailboat-like stanchions and a rigged mast, both of which were removed. The improvement plan also included dropping the mid-to-aft deck two feet from its original nearly flush four inches. 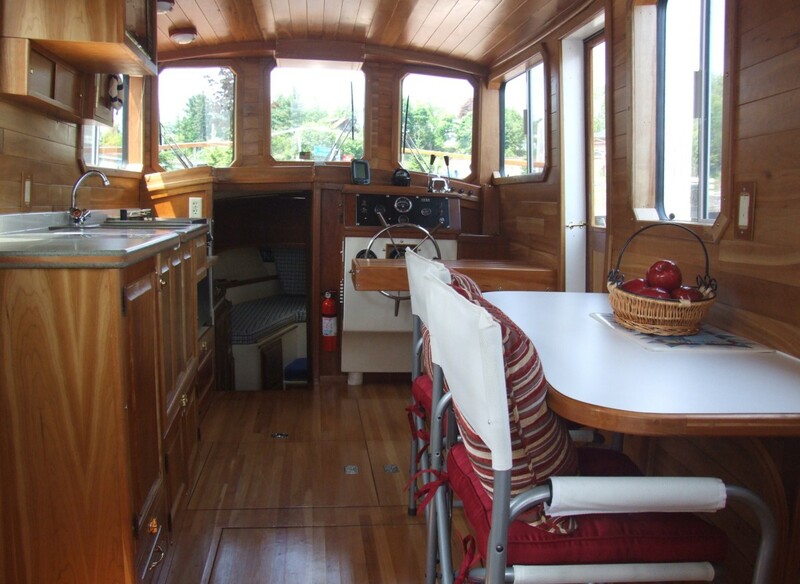 Now a shaded stern cockpit featuring comfy striped cushions provides the quintessential back porch for enjoying the ever-changing view of passing traffic and shifting light on the Portage Canal leading to Lake Superior. Avid boaters themselves, Russ and Duffy completed a 7,360-mile circumnavigation of America’s Great Circle Loop, a 55-week adventure beginning in July 2006 and wrapping up in August 2007 aboard the 32-foot Grand Banks trawler Work of Art. Their previous vessels include the Cal-27 sailboat Shavings & Loan. 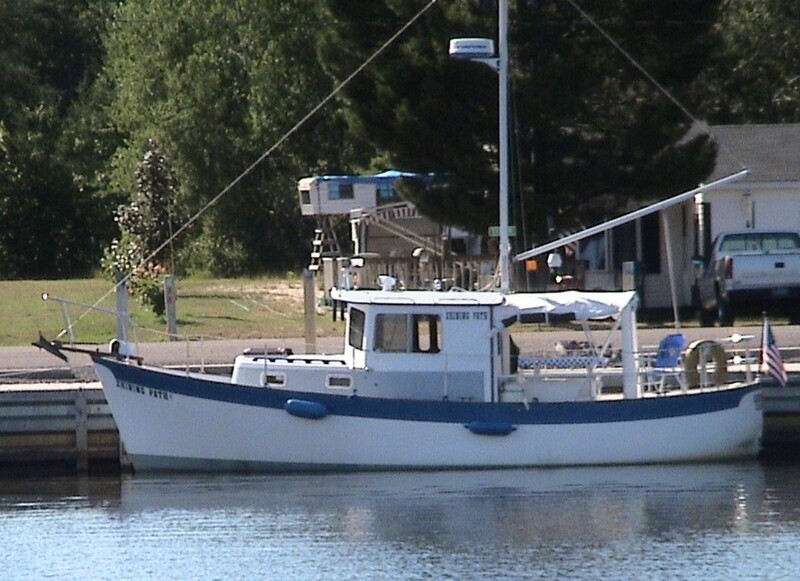 Russ chose a trawler “when we got the bug to make the loop” because he felt that a single-engine diesel with a sturdy keel would be the most efficient, stable and safe way to travel the route down the heartland rivers and up the eastern seaboard. 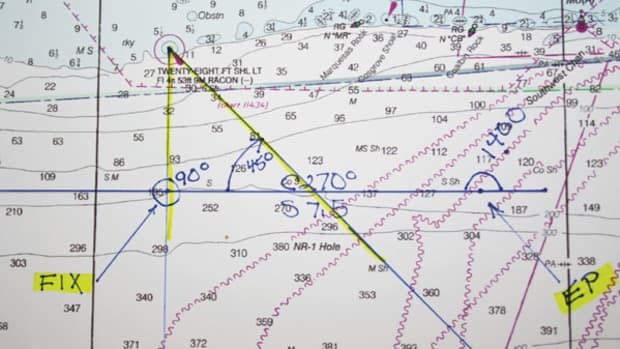 He was aware that there are vast areas of the loop route where sailing isn’t possible. Outfitted with solar power and heat, along with many other clever modifications, Work of Art did not disappoint. Russ proudly reports that the overall repair bill for the entire trip was $117.50, which was expended on a new diesel lift pump. The gleaming, sturdy Brazilian teak deck has no visible fasteners. “I used 36 tubes of 5200,” he says, chuckling. The easiest and most enjoyable part of the project for Russ was building the new deck and cabin. “The toughest part was to cut out the old deck and timbers; they were secured by stainless steel screws which ruined at least 50 Sawzall blades,” he notes. Russ rates the weight difference between the originally 14,000-lb. boat and its weight after the re-do as negligible. “The decks that were removed were extremely heavy timbers encapsulated in 1/2-inch fiberglass. We also removed two extra fuel tanks that added additional weight,” he says. After: The 1976 30-foot Willard Vega Shining Path in her slip at Houghton County Marina. 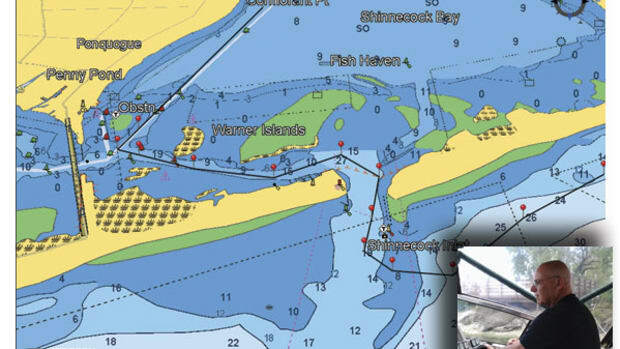 Those words ring true on a walk-through of Shining Path as a late-spring Lake Superior seiche swirls around the metal beams of the dock posts, water rising and falling in rapid undulation three feet up and three feet down. The readily accessed engine room revealed by the quick removal of a floorboard shows an immaculate 50-HP Perkins diesel. Unlike many boat owners, John didn’t feel the need to tidy up before showing off his vessel. She’s always immaculate and ready to go. Nancy is still working as a nurse at Baraga County Maximum Security Prison, as she has for the past 12 years. Shining Path is her stress-relief valve; she’s content to enjoy R&R at the couple’s slip at the idyllic Houghton County Marina. “This is strictly my thing for now,” says John. “Nancy’d be plenty happy if we never left the canal.” The couple’s Lake Superior travels include cruises to Grand Traverse Bay on the south side of the Keweenaw Peninsula and the Eagle Harbor docks, on the north side. At the Grand Traverse public dock John had to invoke the Harbor of Refuge statute one year when as a wildfire raged on a nearby blueberry farm and firefighters ordered the couple to leave. Faithfully adhering to principles learned in the boater training course they completed, John and Nancy endured the smoke and commotion, wisely waiting for Superior wave heights to decrease before venturing out into open water. With Shining Path now fully equipped for comfortable, functional live-aboard cruising, longer passages await. Renovations combine pretty and practical; the more spacious, user-friendly interior balances the richness of custom woodwork with cheery red accents and new windows that bring sparkling waterside vistas in.